– The psychiatric assessment of Anders B. Breivik should not be recognized and Breivik reconsidered. The experts in this case have obviously lacked expertise in key areas. Vepsens editorial secretary, Tor Bach, who has written about extremist groups for 20 years, is handing out a slashing critique of psychiatrists report that stamps ABB as a paranoid schizophrenic. – The two psychiatrists have consistently dealt with Breivik’s opinions as symptoms of psychosis, without relating them to the views Breivik advocates abound in a political environment. They obviously lack essential skills in political extremism. With the methodology they have used to conclude that Breivik is psychotic, would all the right extremist groups, and any revival preacher be considered crazy. Bach emphasizes that he is very surprised by the contents of the report. – I had basically trust that the experts had reached a correct conclusion, and was excited about the details which had hitherto been unknown to the public. The idea was then to write a general news story, but I quickly realized that it would be a party post and no neutral article. 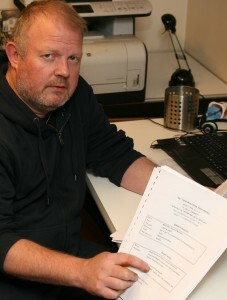 Bach believes that many of the arguments of Breivik’s alleged mental illness appears to be impractical. – They point out that the delinquent was afraid of being bugged. Yes, just think, it would not actually surprise me all the time he was planning to blow up the government building in the air. Any terrorist with more than half of the brain intact would be the more worried about that sort. Another example of the fly as evidence of Breivik’s bizarre and grandiose ideas that he sees himself as someone who will save Europe from Islamization. Yes, this is something quite a few think, and if one would forcibly treat everyone, we would end with the Soviet variant of political asylum, says Bach. He also points out that psychiatrists are concerned Breivik’s detailed descriptions of orders and insignia to be used on uniforms. – This is the kind of thing many in extreme environments are concerned about. A Norwegian Nazi group made a few years ago a uniform regulation of all three pages of his own court, a group that spoke a couple of handfuls of people. The grandiose ideas is an important characteristic of extremist movements. Imagine, for a few years ago we had a mini party would use the Norwegian oil fund to build Norwegian bases on the moon. Bach’s states that it is not enough to invalidate the existing report. It is also important that new experts, including at least one that must have expertise in political extremism, must make a new assessment. Also others have reacted to breivik report. VG Anders Giaever says in a comment that psychiatrists by googleing what they perceived as neologisms that had arisen in Breivik’s head, could easily have found out that these are concepts that are in common use, including the communities Breivik frequented online. Bach points out that David Copeland, the British Nazi who in 1999 stood behind a 13-day bombing campaign against minority communities in London were also diagnosed as paranoid schizophrenic. – It was only when one of the experts went through Copeland bookshelves that they realized that the man belonged to a movement sharing Copeland ideas, that they understood that the diagnosis was wrong. Copeland was later sentenced to at least 50 years in prison for six murders. Bach does not want to go into any assessment of whether Breivik should be diagnosed as insane.